The block winners have been determined for the Best of the Super Juniors tournament. The way the points were spread out gave way to some interesting possibilities. In some cases the right wrestler needed to win or lose for someone to possibly advance to the finals. Chase Owens vs. Ricochet: Wow, talk about playing the role of spoiler. Owens only had two points going into this match. A win here does nothing for him, but it would eliminate the tournament’s point leader, Ricochet. If Ricochet wins, he is the Block B winner and advances to the finals. The Match: In true Bullet Club fashion, Yujiro accompanied Owens to ringside. Every time Ricochet hit Owens with a big move, Yujiro would either interfere or pull the referee out of the ring. I know the rules are more relaxed in Japan, however, the amount of blatant cheating bordered on the edge of ridiculousness. Owens even tried to use a chair, Ricochet grabbed it, the referee took it away from him, and Owens nailed Ricochet with a pair of knux. Owens kicked out of a benadryller and brainbuster that shocked the crowd. Ricochet missed a phoenix splash, Owens rolled him up and Yujiro helped hold him down for the three count. Afterwards, Owens acted like he won the Superbowl while Ricochet couldn’t believe that couldn’t kick out and is eliminated from the tournament. Will Ospreay vs. Volador Jr.: The winner of this match goes to the finals. Ospreay comes in with 8 points while Volador is carrying 10 points. I got the sense here that Volador wanted to prove that Lucha Libre still produces the best high-flying wrestlers in the world. That’s hard to argue now that England’s Will Ospreay has taken the sub-genre to another level. The Match: There were a lot of high flying moves here. Obviously. Volador has Ospreay on his heels for a while. During the heat, Ospreay did a backflip off the top rope and hit Volador with a picture perfect DDT on the way down. The finish came when for the Spanish Fly off the top rope, Ospreay landed on his feet and quickly hit a springboard cutter off the middle rope for the win. Ospreay celebrated like a kid on Christmas morning once it was confirmed that this win made him the Block B champion, which means a trip to the finals and one win away from the trophy and a title shot. Rocky Romero vs. Kyle O’Reilly: Kind of the same thing here with Owens/Ricochet. A win here did nothing for Romero but a loss eliminates O’Reilly from the tournament. The Match: After escaping an armbar, Romero delivered a sliced bread and followed with a jumping knee strike for the pin. O’Reilly is out after having such a strong showing through the tournament. He was my pick to win the tournament after he made to the finals last year. Ryusuke Taguchi vs. Gedo: Gedo is already eliminated from the tournament. Taguchi not only has to win this match but hope that BUSHI beats KUSHIDA in the main event to advance to the finals. The Match: Man, the bell hammer is Gedo’s best friend as he uses it, again, this time to attack Taguchi. At one point, Taguchi mocked Gedo by going for the rainmaker, but Gedo avoided it only to be met with a kick to the face. The finish came when Gedo went for a modified camel clutch, but Taguchi somehow reversed it for the pin. KUSHIDA vs. BUSHI: A win for KUSHIDA sends him to the finals while a win for BUSHI sends Taguchi to the pay window. The Match: BUSHI hit KUSHIDA with a DDT on the apron. Later on BUSHI went for an armbar, KUSHIDA countered and attempted one of his own, but BUSHI was able to escape. Of course, the referee was knocked down, which gave BUSHI the opening to spray KUSHIDA in the eyes with the green mist. BUSHI hit a codebreaker for a two count and hit KUSHIDA with a second codebreaker, this time off the second rope for the win. KUSHIDA is eliminated, Taguchi is the A Block winner and advances to the finals. After the match BUSHI took KUSHIDA’s championship belt, spewed green mist on it and demanded a title shot. 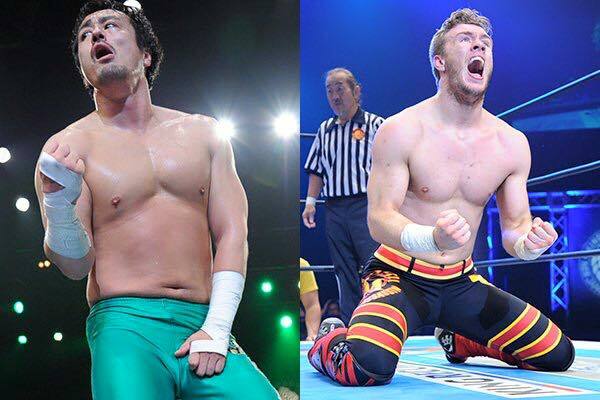 Final Thoughts: Ryusuke Taguchi vs. Will Ospreay is the final match to decide the Best of the Super Juniors winners. I’m glad Ospreay is in the finals after having an impressive debut in the company and losing some matches early in the tournament. I believed that Taguchi days on top of the jr. heavyweight food chain were over. He is either putting over the popular newcomer or maybe he is getting another run with the belt. Either way, this should be a fun match.